For us, nothing beats the satisfaction of seeing happy smiles on your faces. We know that companionship and understanding, more than anything, is what you need to hold it all together. And we aim to make you feel just that. 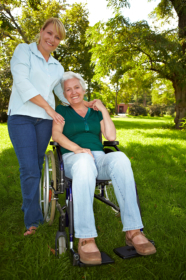 At Loudoun Home Care, we provide the kind of care wherein we assist you whenever you need us. We want to aid you in your road to mobility. We transform your home into a more conducive place for growing old, or for coping up with a disability. We are your support. Our caregivers are chosen after a throughout interview process and nationwide comprehensive background screening. Because at Loudoun Home Care, you are a member of our family. And whatever makes a member of our family happy makes our hearts fill to the brim with joy.